Far off in the universe, there’s a remote galaxy that shines as bright as 300 trillion suns and according to NASA, it is currently the most luminous galaxy ever seen. Discovered by NASA’s Wide-field Infrared Survey Explorer (WISE), this super-distant galaxy is so bright it’s belongs to a new class of objects called extremely luminous infrared galaxies (ELIRGs). Astronomy is always trying to find the most extreme objects. There are millions of galaxies out there. We are always trying to find the most extreme ones to inspire us – how we understand the galaxy or how we understand the universe. Said Chao-Wei Tsai ~ lead author of a new paper. Why its so bright? The newfound galaxy, known as WISE J224607.57-052635.0, is 12.5 billion light-years from Earth — almost as old as the universe itself. Scientists suggests that this galaxy may have a supermassive black hole at the center that’s gorging itself on gas, drawing vast amounts of materials toward it. The resulting orbital disk is soaring to millions of degrees and shoots high-energy, visible, ultraviolet, and X-ray light. This light is then blocked by a thick halo of dust and as the dust heats up, it’s give off infrared light. When materials approach black holes they bump into each other, causing them to heat up and generate light. Another way for a black hole to grow this big is for it to have gone on a sustained binge, consuming food faster than typically thought possible. Andrew Blain ~ co-author of the study. It’s like winning a hot-dog-eating contest lasting hundreds of millions of years. This particular supermassive black hole was already billions of times the mass of our sun when the universe was only one-tenth of its present age of 13.8 billion years. That means it grew that large and that bright during the infancy of the universe itself. Artsistic illustration of WISE J224607.57-052635.0, the brightest galaxy in the known universe. © NASA Jet Propulsion Laboratory. We are looking at a very intense phase of galaxy evolution. 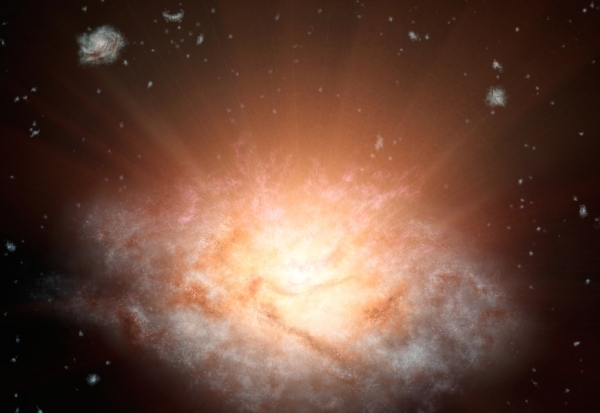 This dazzling light may be from the main growth spurt of the galaxy’s black hole. The pressure of the light actually pushes the gas away, creating a limit to how fast the black hole can continuously scarf down matter. If a black hole broke this limit, it could theoretically balloon in size at a breakneck pace. Black holes have previously been observed breaking this limit; however, the black hole in the study would have had to repeatedly break the limit to grow this large. This can happen if the black hole isn’t spinning that fast. said Tsai. Tsai and his colleagues are planning more researchs to solve the puzzle behind these dazzlingly luminous galaxies. Note: So far WISE has discovered around 20 similar galaxies to this latest, brightest collection of stars. Most only show up well in infrared light, and were not possible to see until WISE came online and photographed the entire sky in 2010.